We have penciled in the remaining meeting dates for 2016. All meetings will be 2:00pm to 4:00pm held at the East Central Ohio Educational Service Center on East High Ave. in New Philadelphia. 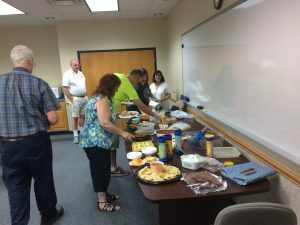 We had our annual picnic lunch and meeting!! We love food at our meetings. We enjoyed the food and discussions during lunch. We did have a brief meeting that we reviewed iCloud and iCloud Drive features, etc. We also reviewed some cool web based applications – Evernote and Wunderlist.